Is it an airport? Is it a town? It's one large services catering for many roads at once. It is located at M1 J23a but the junction has no north-facing sliproads, so traffic heading to/from the M1 north has to leave at J24 and use the parallel A453. First two hours free for all vehicles, after which cars must pay £15 and HGVs, caravans and motorhomes £27.50. HGVs can pay £29 to include a £10 food voucher. Prices are paid using PayByPhone - more details. The location code is 2435. The lake at the back of the services. Donington (commonly misspelt 'Donnington') considers itself to be the gateway to the National Forest, and at the back by the lake there are information boards and viewing platforms. Until the 2016 sign replacement, it was called Donington Park services (the same as the racing circuit, often wrongly called 'Castle Donington'). In 1989, before the A42 was built, a much smaller service area was proposed in the north-east corner of the roundabout. The opening ceremony in 1999 was hosted by TV presenter Charlie Dimmock. On 25 April 2008 Greg James presented BBC Radio 1's Early Morning Breakfast Show (4-7am) live from the services. The Highways Agency had applied to build a regional control centre here in 2004, but it was refused. A Costa drive thru is expected to be built next to the car park. Indoor and outdoor seating would be provided as part of it. The view from the in-built Travelodge. The services were the first to be built with a design compared to that of an airport terminal which, albeit slightly modified, is still used by new services today. It was billed by Granada as "a village by the roadside", aiming to reflect the wide range of facilities which would appeal to commuters. It's the only service station where a hotel is thoroughly built-in to the main building: some have access to the motel through the building, but few have the motel as a second storey. This design takes advantage of the fact few services had a hotel franchise from new, in doing so reducing the impact the construction had on the local environment. When it first opened the forecourt had a Sketchley dry cleaning and a photo development service, allowing commuters to stop by on the way to and from work, joined by a rare example of a Moto Fresh Express café in a forecourt. 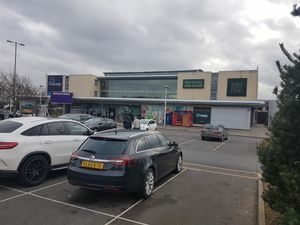 The main building opened with shops including Knickerbox, Tandy Express, Thorntons (which lasted a lot longer than the rest), Tie Rack, The Sock Shop, Halfords and Early Learning Centre. The services were the first site to gain a Marks and Spencer store - at its time it was the smallest of their stores in the world, but it was then extended and re-branded to M&S Simply Food. It was built where the Burger King was, and the Burger King was moved further back. A WHSmith store also opened here, replacing Birthdays and the Moto Shop. On 21 May 2013, a franchised Harvester opened here on a trial basis. If it was successful, Moto planned to roll out Harvester across their network to replace Eat & Drink Co. . As of 2017, Harvester still survives at Donington but has not been rolled out to any other Moto sites, despite many other restaurants being refurbished. This site is home to one of Moto's first internal West Cornwall Pasty Co units.